The victory of William I at Hastings marked not only a transition in the ruling class of Britain but also the beginning of a metamorphosis for the Saxon and Welsh landscapes. For in the years directly following their conquest, the Normans and their cohorts turned to feudalism–and the castle–to complete the subjugation of the vanquished. 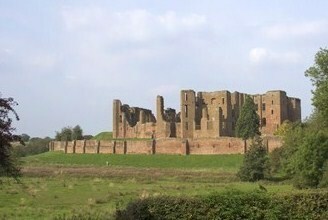 From the late 11th century to the mid-15th century scores of castles were erected across the realm–many over former Anglo-Saxon cemeteries and Roman ruins–as each successive dynasty sought to solidify its control over the Kingdom. The castle ruins these feudal monarchs left behind provide a fascinating window into the past and remain tangible relics of a chaotic time during which countless lives were turned upside-down as lordly dynasties rose and fell. They expose their builder’s tastes, socio-political power, and sophistication. They reveal an epoch when the masses had to deal not only with warfare and local rivalries but with the very basics of daily survival. They are lasting symbols of an era of strife and social status, of political mayhem, and cultural evolution. Regardless of their size or condition, each provides a unique glimpse into history. Our journey begins in Southeastern England where we explore the impressive remains of Rochester castle, a Norman fortress built in 1127 by William of Corbiel, Archbishop of Canterbury, to guard a strategic crossing over the River Medway. Further exploration takes us to Dover Castle–perched atop the iconic white cliffs along the sea–one of most impressive and quintessential castles in all of Britain. Here we find structures from virtually every era of British history, as well as elements from prehistory, the Roman era, and the Anglo-Saxon occupation of the site. The remarkably well-preserved castle was used almost continuously until the Cold War, and was in fact a key staging point during World War II. The great keep erected by Henry II, arguably the most impressive of its kind, has recently been restored to its presumed medieval state. 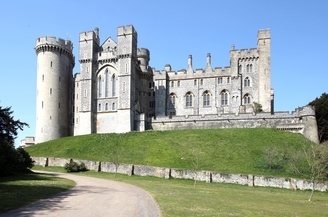 From Dover we journey west across Southern England stopping at the majestic castles of Arundel and Lewes. 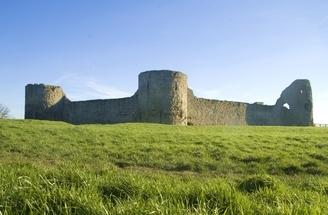 At Pevensey in East Sussex we encounter a castle directly associated with the Norman invasion. Built just after the conquerors landed, this example of earth-and-timber architecture was erected inside the ruins of the prior Roman fort and reveals a key strategy of the new rulers – by building over many earlier sites, the Normans put forth a psychological message that they had conquered Britain and they had no intention of backing away. 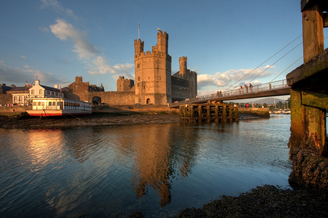 Continuing west, we explore many remarkable sites in beautiful Southwestern England and South Wales. 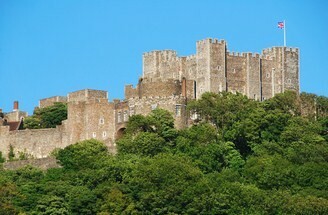 At Berkeley Castle – one of Britain’s oldest continuously-inhabited castles and the site of the imprisonment and murder of Edward II – we are provided an exclusive presentation on the structure’s history by the castle archivist and, if we are lucky, we enjoy a brief visit with the castle’s current resident, Charles Berkeley. 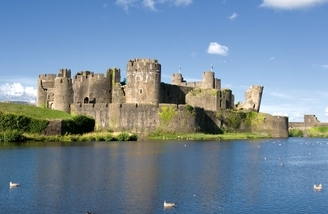 At Caerphilly we encounter the first fully concentric castle in Britain–consisting of a complex of stone and water defenses, it was modeled on mighty Kenilworth Castle, which we explore later on our tour. And at Raglan we see one of the last great fortresses erected in Britain; an imposing structure which held its own against the bombardment of cannon balls during the English Civil War. 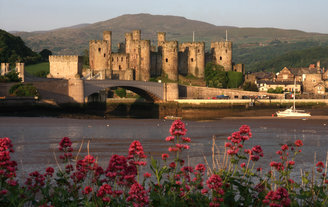 Today, its polygonal towers and machicolations welcome visitors into a complex of ruins that represent the essence of castle life – from the kitchen range to the state apartments, and from the powerful Yellow Tower of Gwent to the great keep with its fascinating apron and water-filled moat. Along the way, our sojourn leader brings the history of the castle to life, pointing out the unique features of the structures and impressing upon us the purposes each served. We discover not only the reason why castles have captured the imagination of tourists for centuries, but also why archaeologists and historians continue to examine castle remains. These tangible relics reveal a remarkable past, a lengthy heritage etched in stone as well as with the blood and sweat of those who built, labored, fought, and died in their shadow. They stir in us a profound awareness of those lives and they impart a timelessness that inspires awe no matter their condition. The story of just how so many of these remarkable structures came to be is every bit as fascinating. 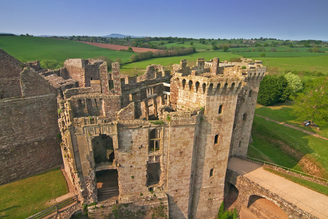 That medieval castles have endured centuries of warfare and the effects of weather is a testimony to the creativity and power of their medieval builders. How many of our modern-day edifices will leave such long-lasting legacies?